Your heavy-duty Mack® Truck engine pumps oil at the rate of about 30 gallons per minute. With today’s longer drain intervals, that could be enough to fill three Olympic-size swimming pools before your next change. That’s why it’s important that when you fill, you use an oil that’s made for your hard-working truck – Mack® Engine Oil, along with Mack Engine Filters. Not all heavy-duty oils are the same – not by a long shot. Mack Engine Oil is more than just a lubricant. It’s specially formulated to handle today’s high engine operating temperatures, heavy hauls and tough operating environments. Regular preventive maintenance is critical to engine health. Just as you have blood tests when you get a physical, it’s a good idea to have your engine oil analyzed regularly by Mack-certified techs. An oil analysis can help maximize your drain interval and flag potential engine problems. A multi-point lube and level check should be done during the same service appointment. Your Mack dealership’s factory-trained techs will use lubricants and fluids that are Pure Mack – designed to keep your truck working at peak performance no matter where the job takes you. Mack Engine Oil fights the buildup of soot and dirt that can wear out your rings, liners and valve trains. Mack Engine Oil is field-proven to isolate harmful contaminants so they can be filtered out before they damage your engine. Mack Engine Filters do the best job of getting rid of the gunk, to keep your oil flowing more freely and protecting your engine better. Your high-performance Mack truck is designed for maximum fuel efficiency and minimum oil consumption. But it’s important to give it the care, the oil and filters, and the lubricants it needs. 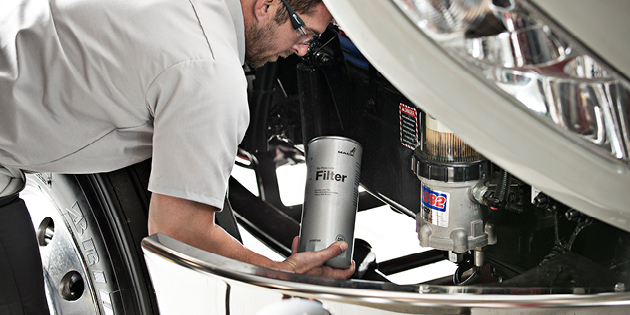 See the service and parts experts at your nearest Mack Trucks dealership. Fleet managers: Ask your Mack dealership about the advantages of Mack Engine Oil, Mack Engine Filters, Mack lubricants – and ordering in bulk. Mack Engine Oil meets or exceeds the performance standards for every truck in your fleet. It can double the recommended drain interval and maximize engine service life. Order online through SELECT Part Store for convenience, quick delivery and regular specials on high-demand parts and supplies.